Sacacomie, QC – Though it’s taking its time getting here, the new 2019 Volkswagen Arteon is, we can confirm, on its way to Canadian VW dealers. The German brand’s Canuck division had invited a few members of the automotive press to come and test drive the model that’s replacing the old CC. Or if your prefer, you can consider it the second four-door coupe in history after the Mercedes-Benz CLS. 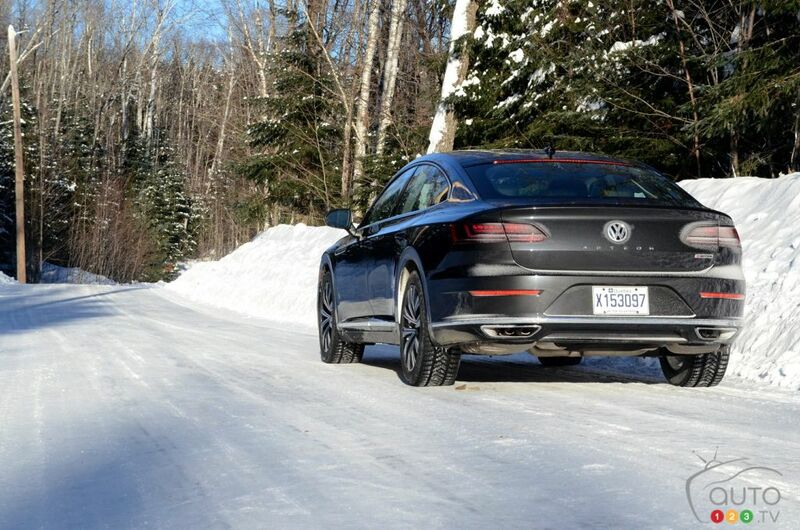 Our first contact with the big lug took in Sacacomie, in Quebec’s Mauricie region, was especially instructive as to the 2019 Arteon’s capabilities in winter. Not only does it come with a 4-cylinder turbo that’s more explosive that the CC’s, it also gets the 4MOTION all-wheel-drive system, which has more than proved its worth over the years. 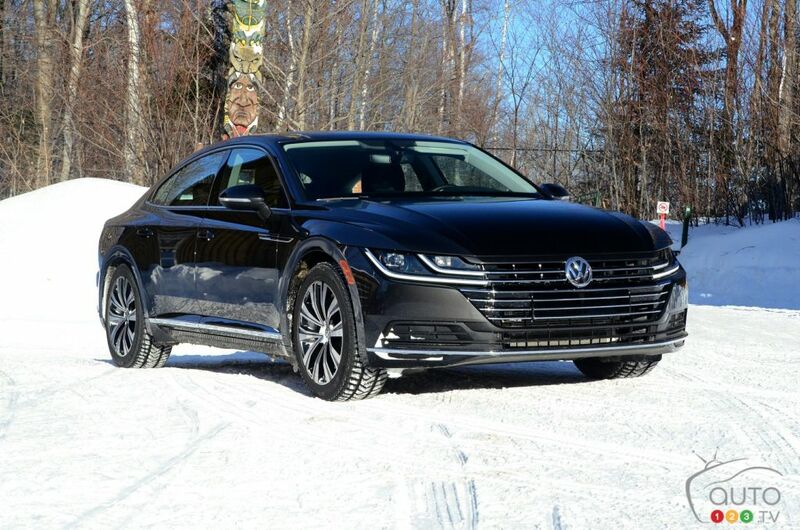 Here’s a rundown of our first test run of the 2019 Arteon on the ice and in the snow. The rather pretty exterior shell sits on a new platform called the MQB, the same that underpins recent VW models like the Tiguan, Jetta and Atlas. It’S this new architecture that allows the Arteon to inherit a more pumped-up powertrain than the Passat, which targets an audience for whom performance is less of a priority. Under the hood, VW has placed a 2.0L 4-cylinder engine generating 268 hp and 258 lb-ft of torque. The only transmission available is an 8-speed automatic unit, the one that’s spread and far and wide across the Volkswagen lineup. And ,as mentioned, there’s the 4MOTION AWD system, a rather handy function to have when the road conditions tank… like they did during our test drive! The Arteon is new on the North American market, but a look at the spec sheet provided by Volkswagen makes it easy to situate the car. Simply put, the new coupe-sedan is very similar to the CC in terms of its dimensions. A little longer, a little wider and a little lower to the ground, the Arteon also has a longer wheelbase, which translates into more interior space. The car is also a more imposing presence on the road than was the CC. Who wants to be flagship model? It’s been many moons since the Phaeton disappeared from the scene in North America, and the Passat can’t really be considered like a flagship. 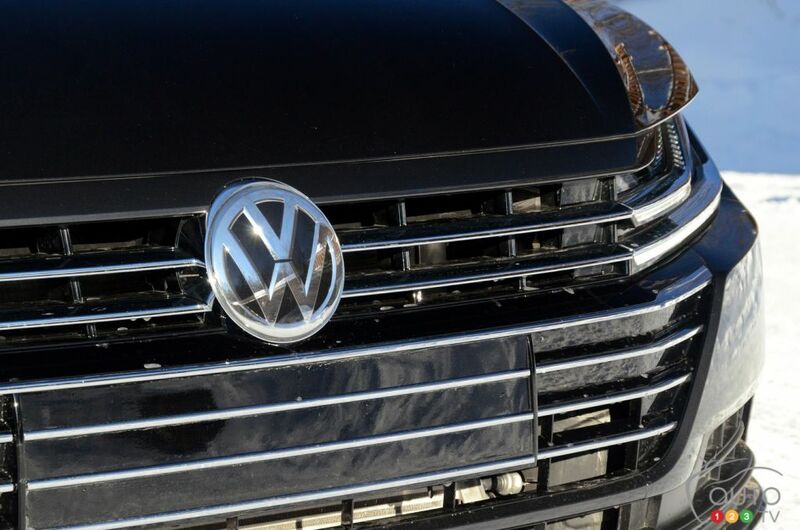 The Touareg could have assumed the mantle, but it too has decamped! The Arteon, with its high-end-car design and feel, actually has the attributes to assume the role. So it becomes the new flagship – at least on this side of the Atlantic! While dimensionally the Arteon is in the same ballpark as the CC, design-wise it’s a whole other story. The front end, with its front grille that stretches across and out in all directions, even spills into the headlights themselves, which are also severed at the top by the hood. The hood , in turn, ends abruptly on the front wings. The least you can say about the love-it-or-hate nose of the car is that it leaves few people indifferent. 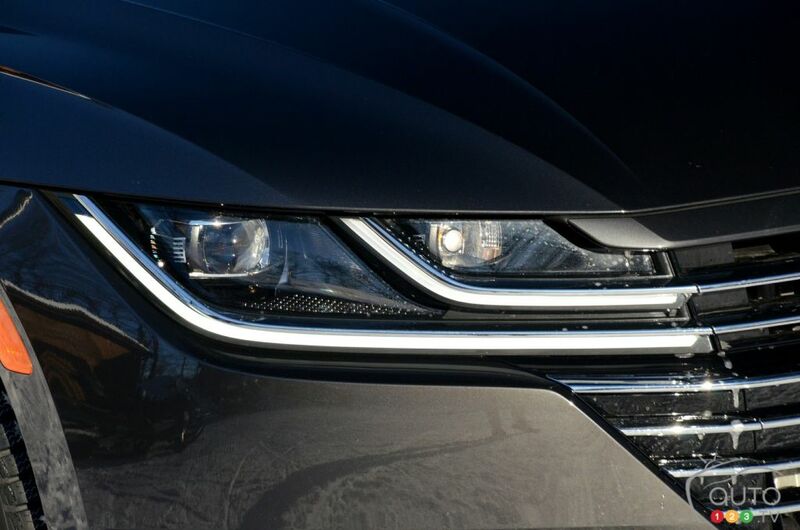 The profile view of the Arteon shows a pinched set of windows, but the elevated form as you move towards the rear adds style to the whole, plus it proves highly practical when you’re changing lanes thanks to a reduced blind spot. The back end is a simpler affair, although a closer look reveals a nifty surprise: the trunk has been replaced by a hatchback, which gives the car an added element of practicality. With 563 litres of cargo space (that expands to 1,557 litres when the rear seats are folded down), the Arteon holds its own vis-à-vis a number of SUV models, just without the higher ground clearance. Sitting on 18-inch wheels (the optional R-Line package beings 20-inch wheels into the equation), the Arteon doesn’t really look a sister to the Passat or the Jetta, two sedans conceived with the American market in mind. The Arteon makes like most coupes on the market by sporting window-frame-less doors. The tester we drove on this day was decked in black inside, which does somber down the mood. It’S possible however to get a two-tone interior with lighter colours. The car’s status earns it an exclusive design for the seats, which get contrasting stitching. As for the amount of space available in both rows, it’s downright impressive… for a coupe-sedan anyways! The dashboard of this VW does bring to mind the one found in the new 2020 Passat; the lines cross left to right through the air vents placed within plastic strips. No surprise, the 8-inch touchscreen placed between the two front seats is standard equipment, while behind the wheel another screen (this one 12.3 inches) gives access to a ton of driving data. Aside from the numerous infotainment functions, the most commonly-used commands are accessible via buttons and knobs arrayed around the gear shifter or beneath the centre console screen. Overall, it’s typical Volkswagen: simple and ergonomic! As I mentioned, the heavy winter conditions of our test drive made for some added challenges. The road surface was ice- and slush-covered, which made for road grip that was at times intermittent and impacted on comfort levels inside. And yet, despite the noise coming from the suspension due to the myriad small icy bumps, the sedan held up admirably, in good part thanks to the stiff chassis that reflects the Arteon’s slightly sporty configuration. Clearly this coupe-sedan was designed to drive at pace on a silky smooth German highway, but it handled well on a winding road nonetheless. 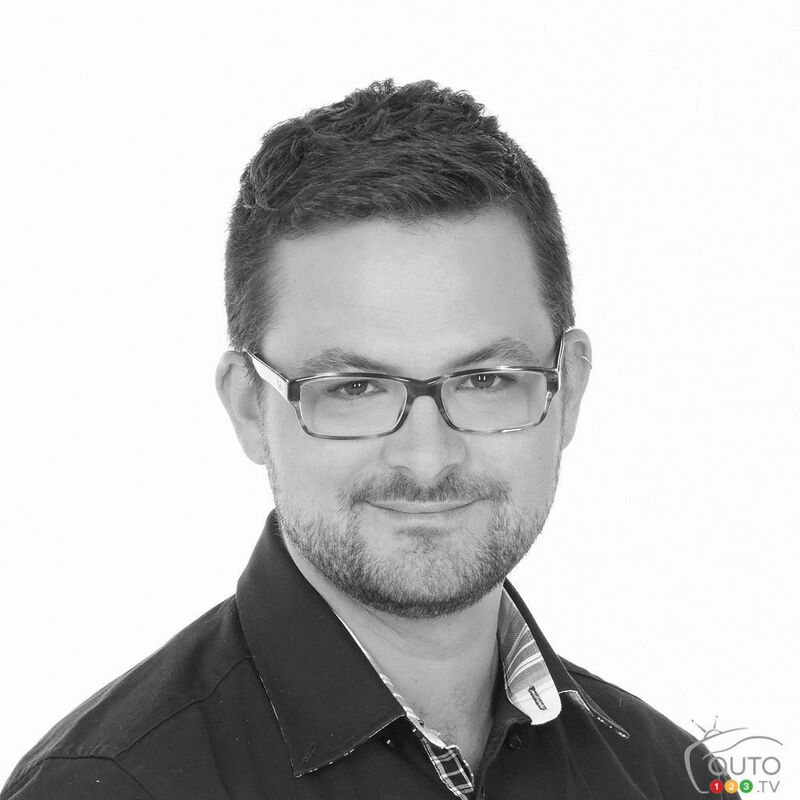 The slippery conditions also allowed us to ascertain the continued competence of the 4MOTION system. The steering could have been tighter, but the nature of the car makes that an insignificant problem. I should also mention that the powertrain is adequate for propelling this car, even if it felt like the chassis could handle quite a few more horses between the two front wheels. The automatic transmission fits nicely with the 4-cylinder turbo engine. The latter, I have to admit, doesn’t emit the most satisfying sound at high RPMs, but that’s OK since after all this is no Golf GTI and its mandate is pretty different. Want ot have a little more fun? Switch to Sport mode using the DCC (Dynamic Chassis Control) system button to modify the parameters of the car. Once again, the electronics do a marvelous job transforming the driving dynamics in this instance. Its starting price of $47,995 means the Arteon is not targeting buyers with affordability high on their priorities list, but we knew that going in. The carmaker is looking to rival compact luxury cars like the BMW 3 Series and Audi A4, but in my view it’s more apt to say this car’s natural rivals are the Kia Stinger and the Buick Regal Sportback, two other hatchback-ed cars that combine sportiness and practicality. The 2019 Volkswagen Arteon has everything to prove since the name is new on this continent, and since it has to resist the SUV tide. But with a bit of luck, the unique design of the car and its typically Germanic driving dynamics could win it an audience among those who stubbornly resist the siren call of the utility models!